In Danner Hall, people may wonder what the long line is for. No it’s just for the microwave. And stomachs are growling and waiting impatiently. “The microwave broke and apparently we are waiting for another one to come in, so we just have one,” said Kathleen Bean of Delta’s Food Services. There were originally two microwaves. Now students must wait in long lines to warm-up food. “There’s only one microwave in Danner Hall. The line is extremely long all the time. We need another microwave ASAP,” said student Dena White. White heard that someone put foil in the broken microwave, causing the damage. 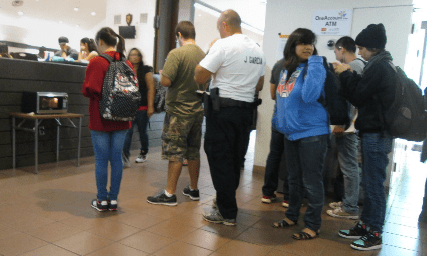 “It makes me late for class, I try to come in here to eat and get to class but I have to wait in this long line which is messing with my class time or my study time and I can’t afford that,” said White. “If I needed to warm something up, I will spend my majority of the time warming something up, and less time eating, wanting to rush to eat in order to make it to class,” he said. Garcia said there should be more microwaves in Danner Hall. He said it’s also an issue for disabled students. The one microwave is located in a main walkway between an ATM and the Student Chef, confusing people. No one knows what line is for what. “There is a long line for the microwave and there also people in wheelchairs trying to get through the line to get to mobility or to go outside of Danner Hall.” said Garcia. He also added that the microwave is located in a spot. The staff are in hope to get a new microwave in the near future.